Feeling tired or bored and need more energy? It's time to blow the cobwebs away! But if you're not sure what that means, join Feifei as she finds out and realises it's nothing to do with cleaning the house! Hello, I'm Feifei and welcome to The English We Speak. … and hello, it's Neil here. Are you feeling OK Feifei – you don't look very happy? Oh Neil, it's been a stressful week – I've been working late, I'm so tired - and I've had no time to do any housework – my house is a mess! Isn't your house always a mess?! Seriously, you need a break. Take some time off. Easier said than done – but how will that help? Well, having a break from work will help blow away the cobwebs. Excuse me? Are you saying I should take time off so I can do my housework – and get rid of all the cobwebs in my house – do you think my house is haunted Neil? I never said you said had cobwebs in your house – what I meant was, get some fresh air – do some exercise, get rid of that tired feeling – that's 'blowing away the cobwebs'! Got it! So no spiders involved? Absolutely not. Let's hear some examples of this phrase in action. Do you want to go hillwalking this weekend? It might help you blow the cobwebs away. I've been stuck indoors for days, I need to blow the cobwebs away and go for a run. I know studying is hard, why don’t you go for a walk in the park to blow the cobwebs away? It might help you think more clearly. 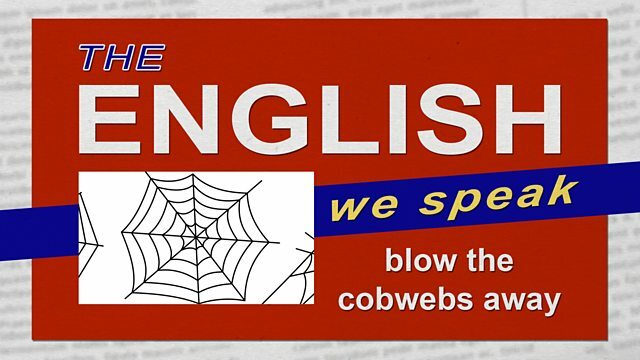 'To blow the cobwebs away' is the same as 'to blow away the cobwebs'. It means to get some fresh air and exercise so that you feel refreshed and can think more clearly. So it's about feeling more lively and alert? Now how about blowing the cobwebs away with me and going for a run? Running? Oh I don't know… I'm feeling a little tired actually. Don't be so lazy Neil! Come on, it's time to blow away your cobwebs too! Maybe I could do your housework instead?